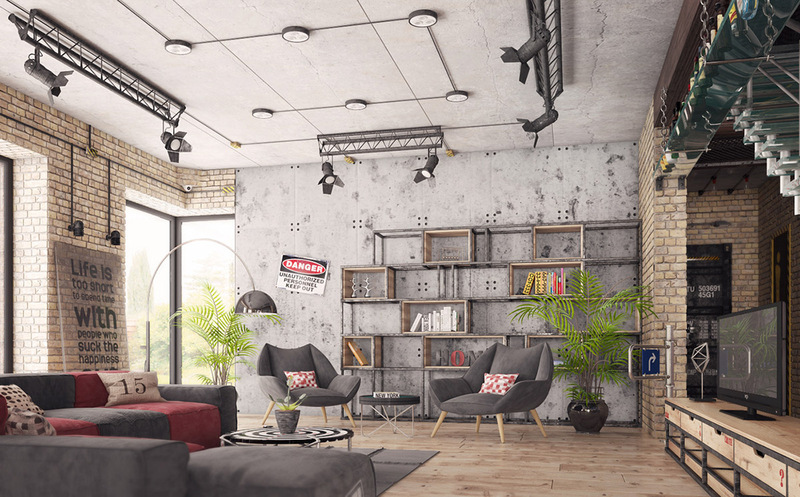 Industrial decor started off as a strong and serious sort of interior design, where chic and shoddy brushed shoulders to equal something edgy. 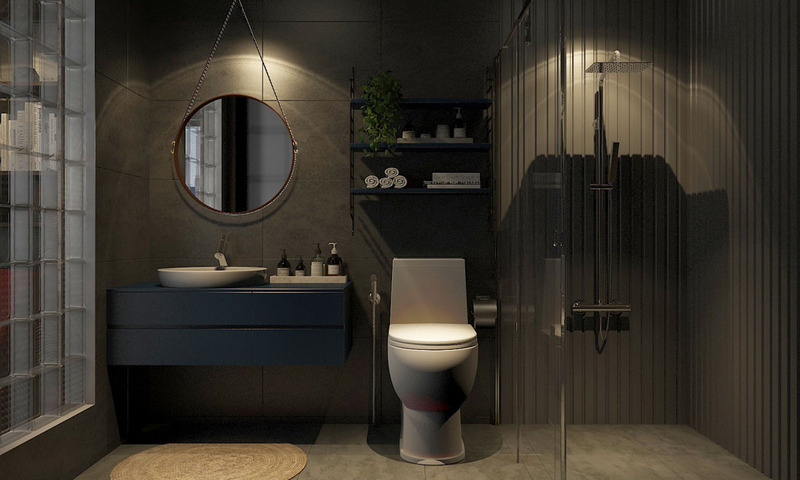 However, as industrial home decor evolves, we’re seeing different styles, themes and influences being fused with the aesthetic. 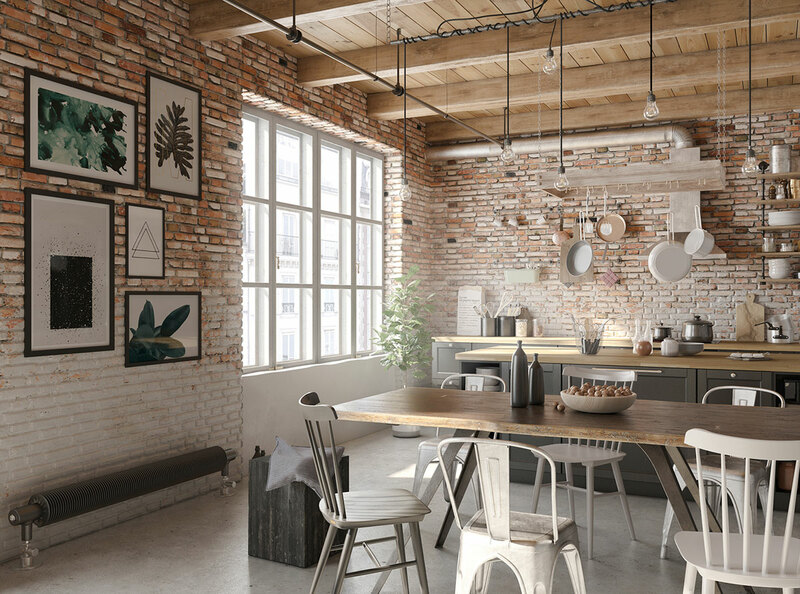 Four industrial style interiors featured in this collection each bring a very different flavour to the industrial table. 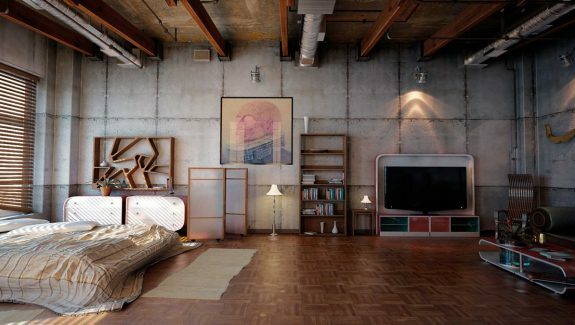 Take a wander around a loft where a love of architecture meets a passion for music; an apartment with a cool comic book mural and wall art; an industrial home with a light farmhouse feel and a colourful place that is positively humming with humour and happiness. 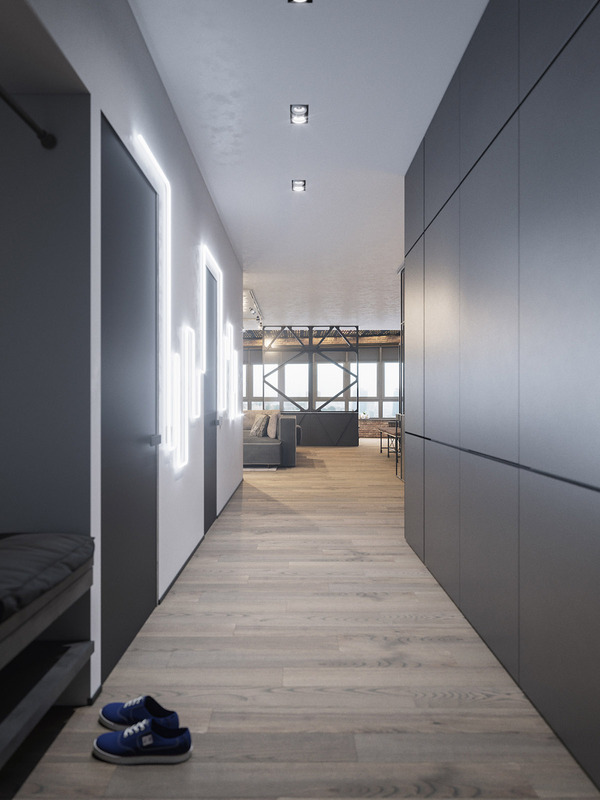 Home number one is an industrial loft designed for a young guy, with an area of 100 square metres. 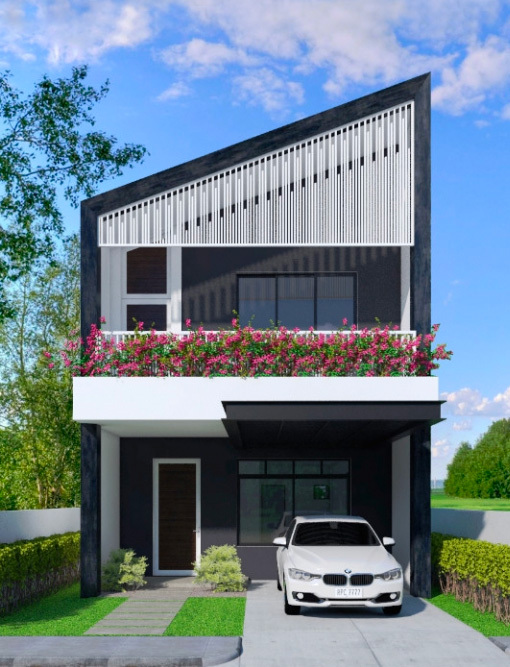 As we look around the home, it’s possible to assume that the homeowner likely has a career in architecture or engineering: A town plan stretches across a wall mural, and an artists easel displays a drawing of a contemporary building facia. 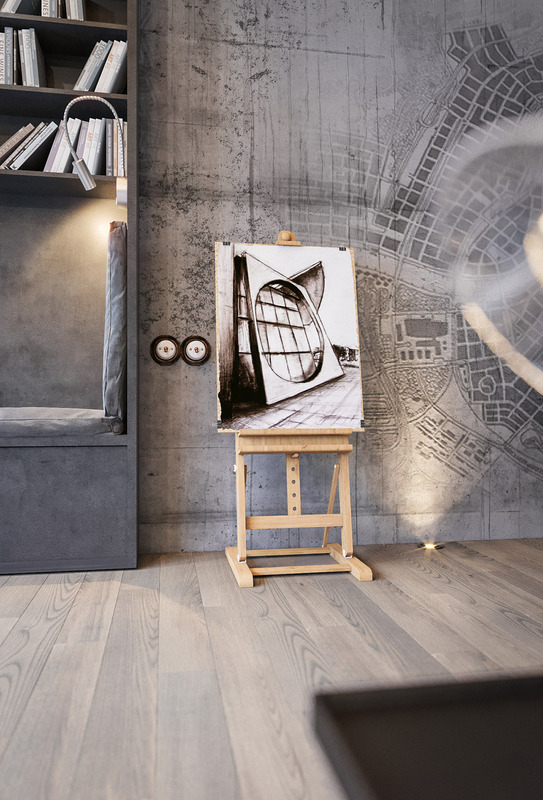 Alongside an appreciation of all things architectural, music themed home decor appears here too. 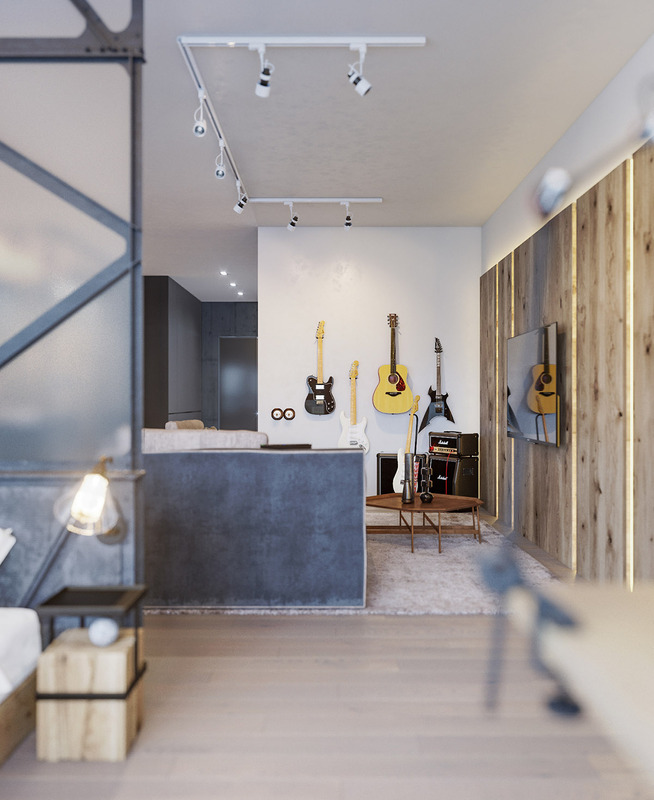 A collection of electric guitars and an acoustic are proudly displayed on guitar wall brackets mounted above a couple of Marshall amps. 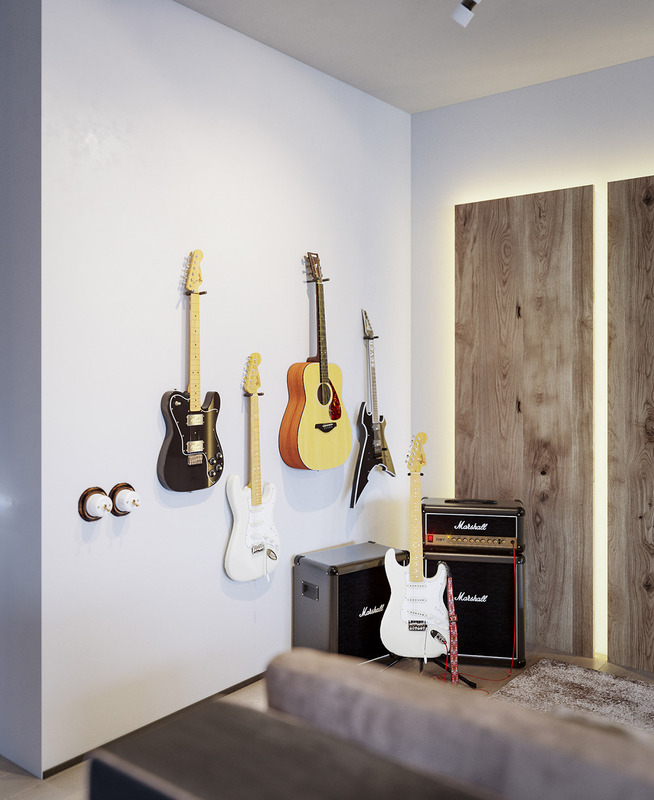 Running off the music corner, the TV wall decor is a gorgeous arrangement of raw wood panels and ambient light. 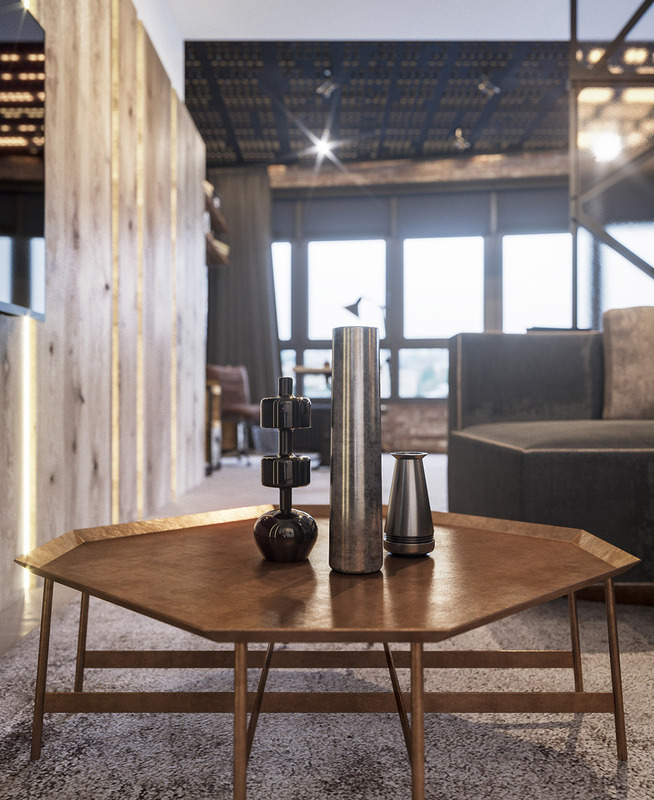 A set of decorative vases on the geometric coffee table could just as easily be a collection of leftover industrial parts. A truly one of a kind dining suite graces the open plan living area. A metal framed four poster table with a wooden top is set upon a set of castors. 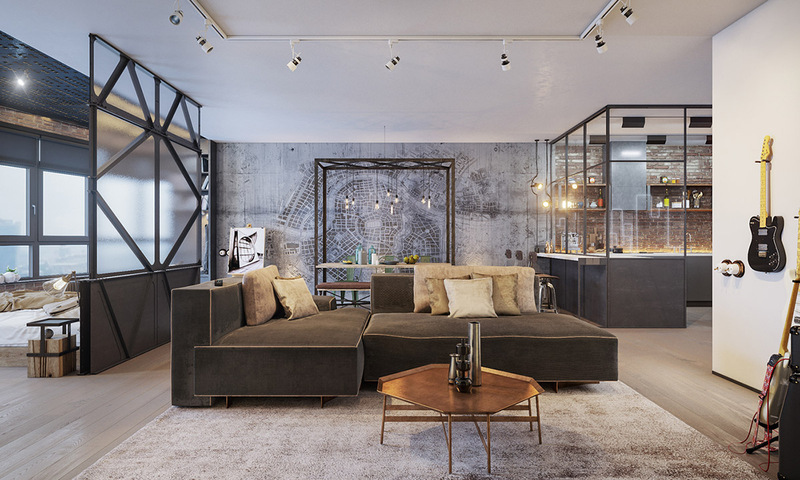 An attached metal canopy criss-crosses overhead like a bridge, bound and strewn in industrial style lighting. A brown leather cushioned bench sits to one side of the table, with three green metal dining chairs opposite. 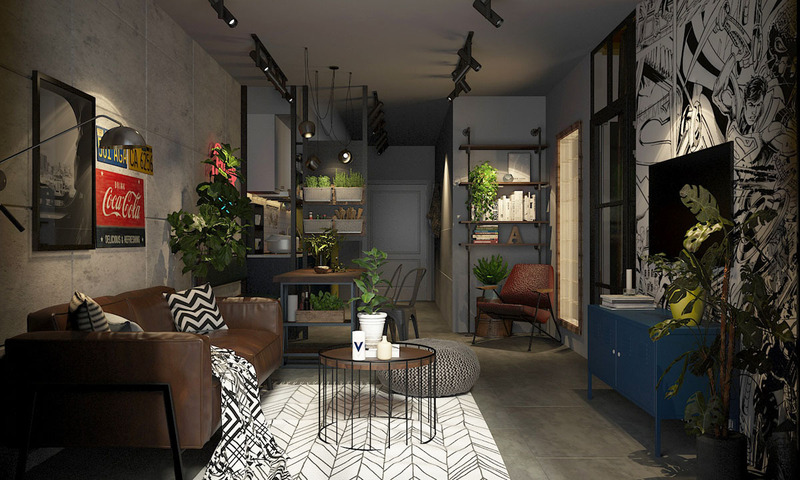 A birdseye town plan provides a perfect tonal backdrop to the showcase the original dining set, which is rustically dressed with decorative vases and fruit bowls. The kitchen is another piece of architectural originality. 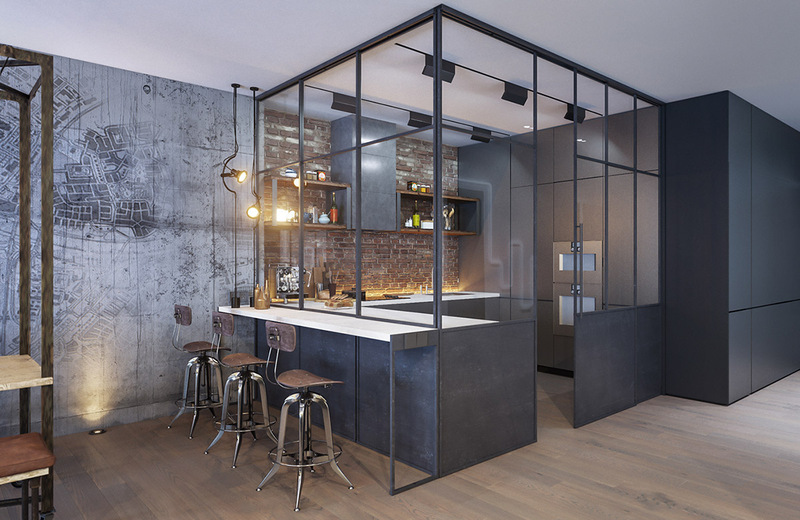 This time metal framework and glass has been erected as a case around the cooking zone, to separate and link it to the living area all at the same time. A breakfast bar extends out the side of the kitchen structure, making it part of the dining room. 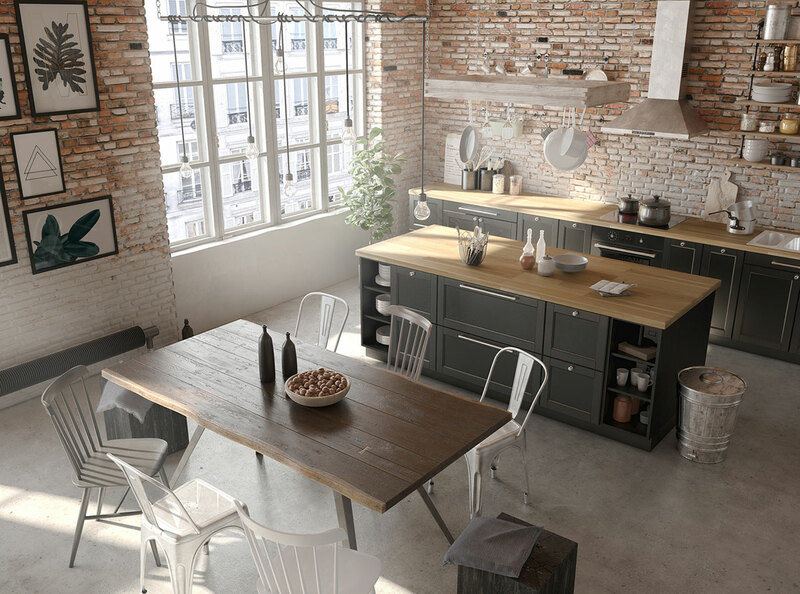 You can find more inspiration for cool industrial kitchens here. 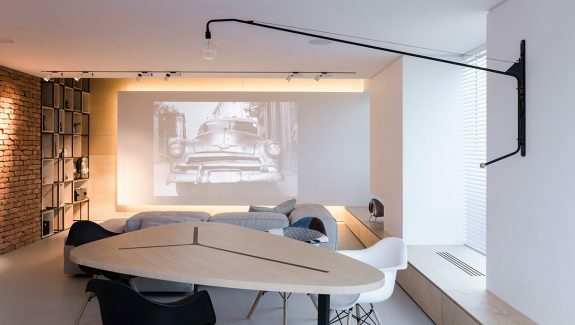 A pair of unique lights are anchored at the bench surface and the ceiling, illuminating the casual eating area and the l-shaped kitchen through the casing. 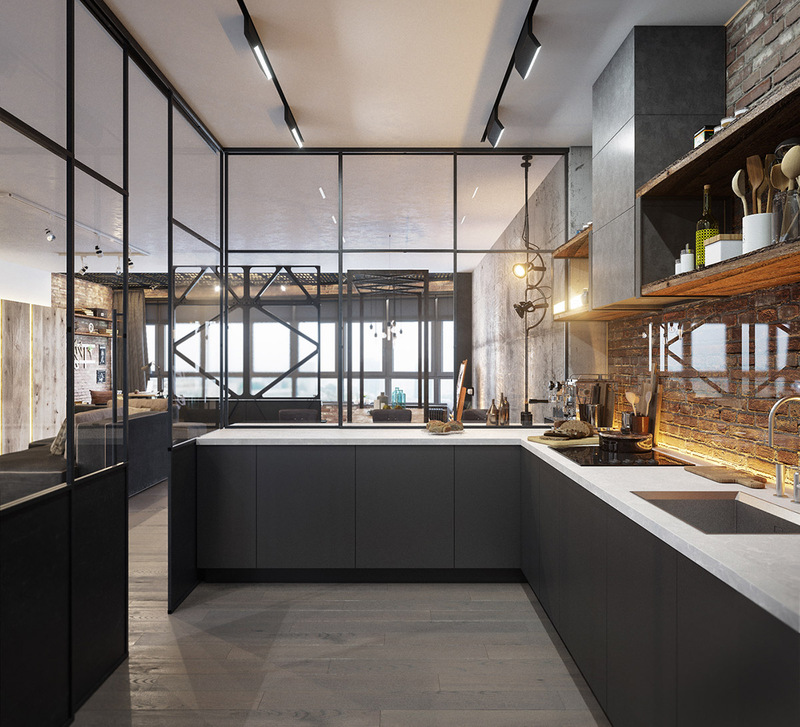 Raw brickwork is made into a wipe-clean kitchen backsplash by preserving it behind clear glass or perspex. The glow of warm lighting accentuates the characterful build texture from the bench line. 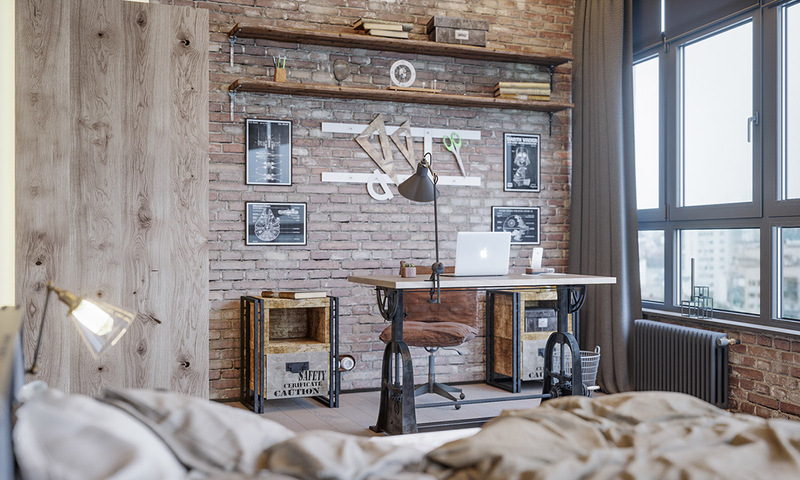 Geometric ironwork builds a dividing wall on which to set an industrial bedroom. 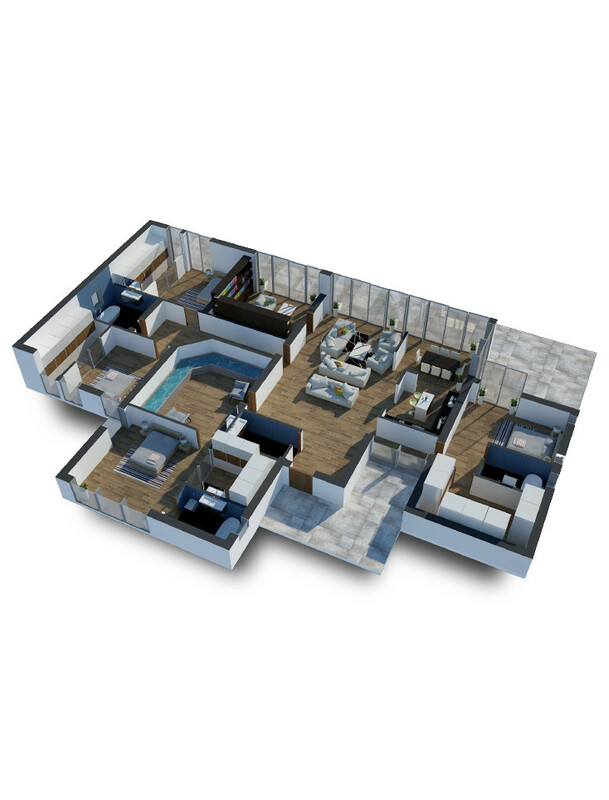 An architectural and engineering mind can get to work at the industrial workspace in the bedroom. Inspiring new creative heights, four Starwars prints display plans of starships and sith armour. 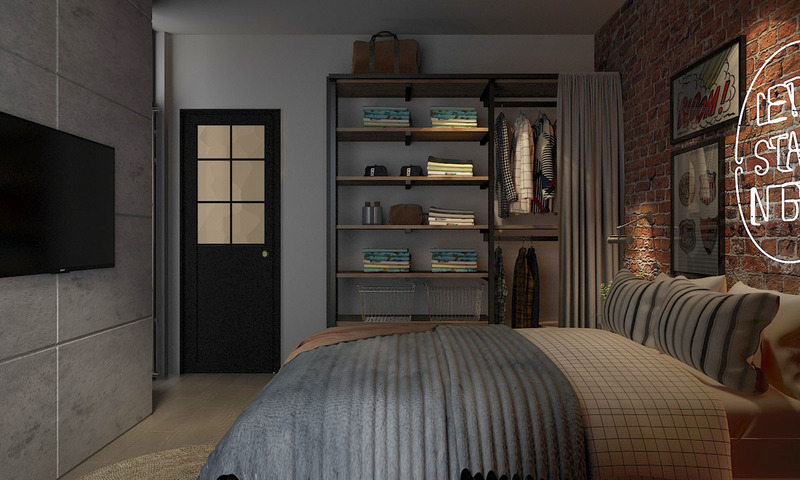 A built-in reading nook nestles on the other side of the bedroom. Neon lights climb a city skyline across the hall wall. Superman storyboard cells explode across a wall mural in our second Industrial apartment, telling us this belongs to a comic book fan – and evidently a lover of indoor plants too. 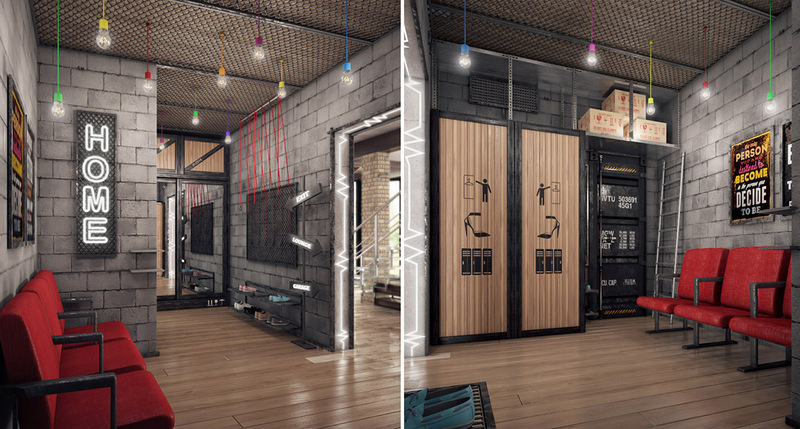 An industrial locker is used as a media console unit below the flat screen television. 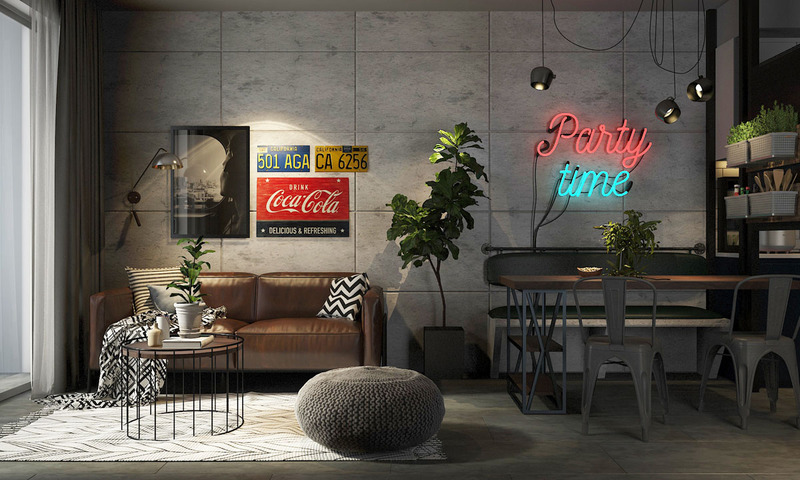 A young party pad feel is at play in the small open plan living room. 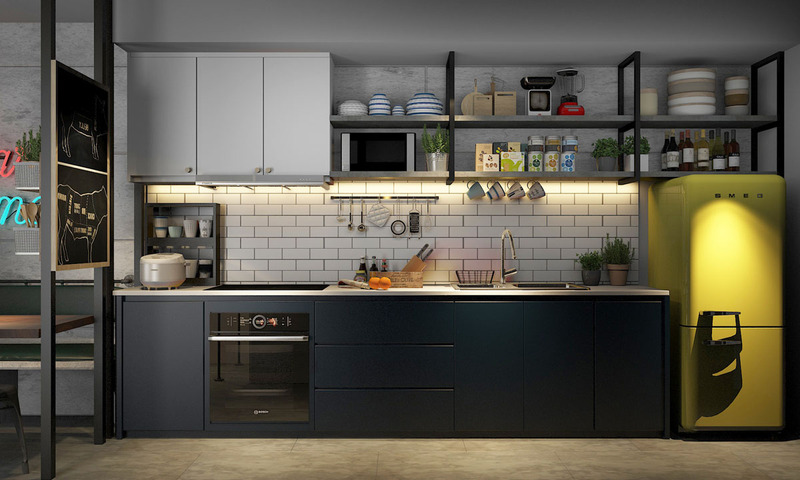 The black and white one wall kitchen is brightened at one end with a bright yellow fridge-freezer. 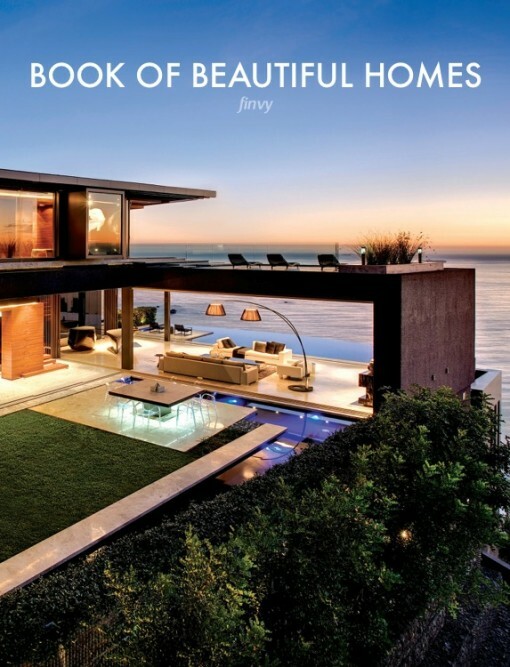 Drama is built by the lighting plan, with focussed light pooling over isolated areas. Another piece of comic book art adorns the industrial bedroom wall. Closet systems are exposed, showing uniformly arranged garments. 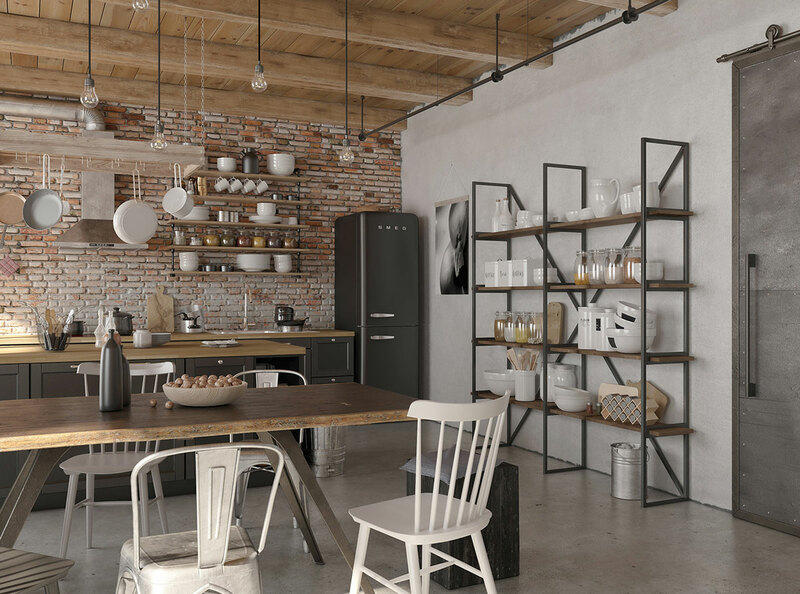 Industrial style mixed with a light farmhouse feel greets us in home number three – plus a dash of rock and roll. 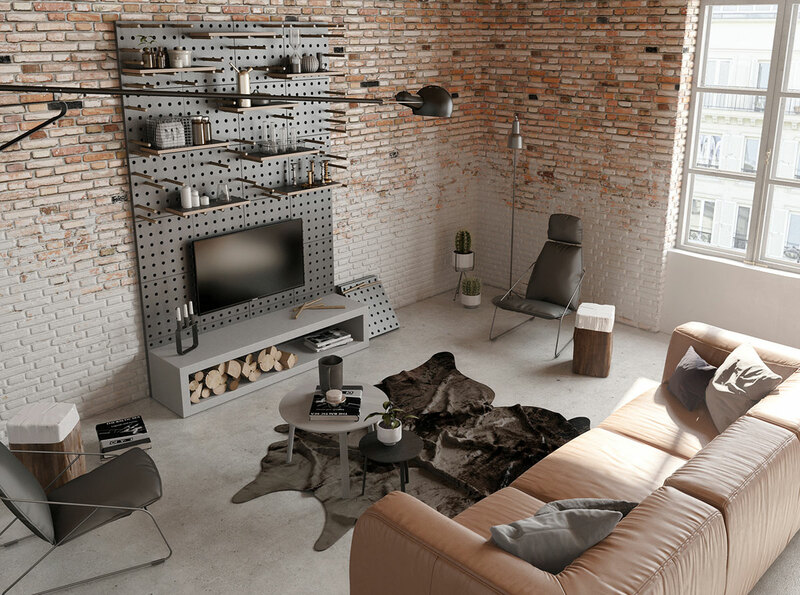 A towering pegboard wall makes a striking piece of TV wall decor. 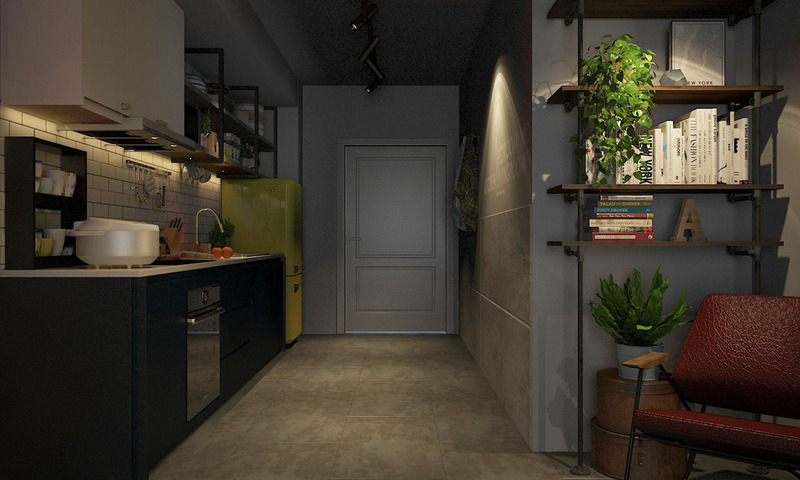 A repositional swing arm wall lamp is the main source of light in the room. 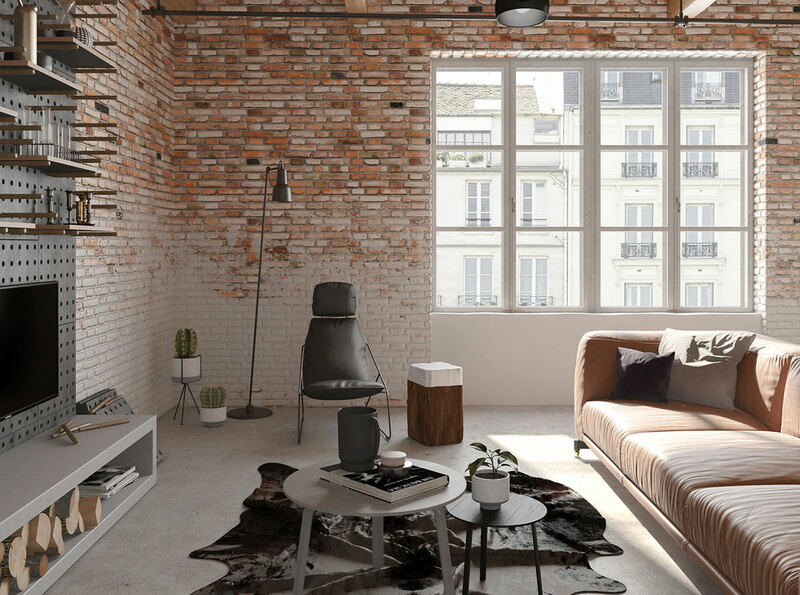 Raw brickwork walls are white-washed across their lower portion, which sets the decor in a state of transition between industrial and country. Pretty white window frames laid bare teeter over the same two aesthetics. A black chair, floor reading lamp and rug stand out strongly against the light backdrop. Open shelving sets kitchen supplies and crockery on show. 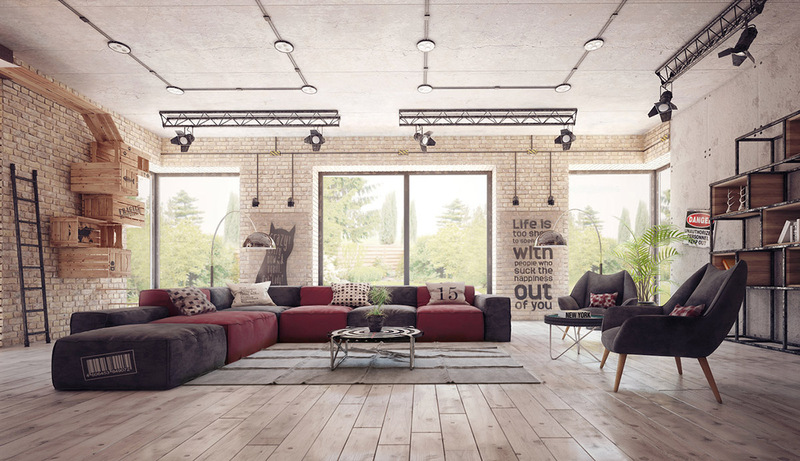 A rustic wood beam ceiling is dressed with industrial style lighting. 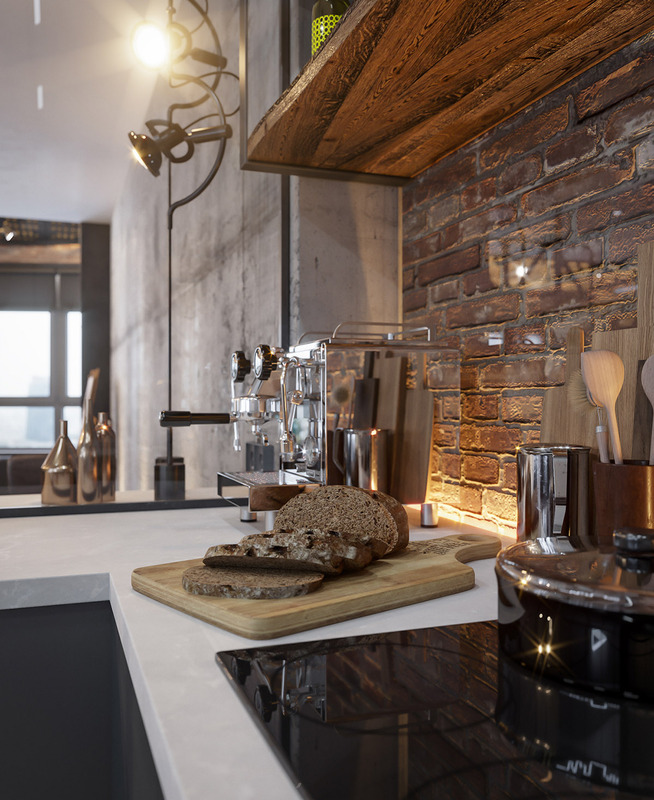 Chunky wooden worktops continue the countryside feel, though the kitchen design is lacking the typical Belfast sink associated with a farmhouse kitchen. 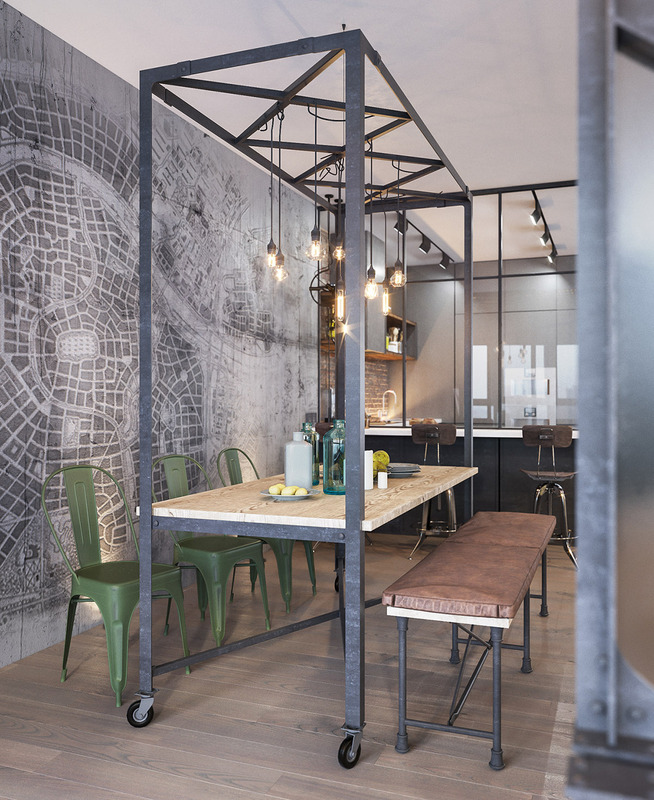 Painted wooden chairs make up part of the industrial dining room set, alongside pressed metal alternatives. 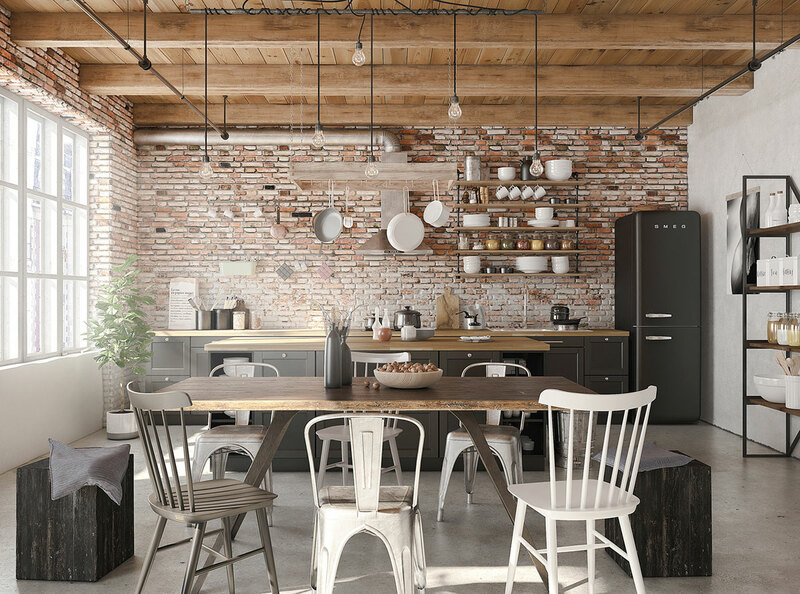 White pans look decorative and light suspended over the kitchen peninsula. Botanical artwork brings a dash of colour to the walls. 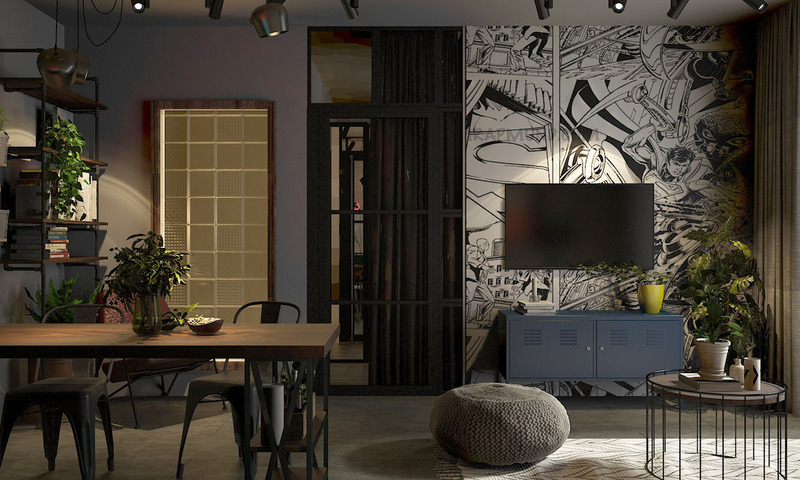 Knocking on the door of number four; we walk into the industrial living room of a 270 square meter two story cottage near Kiev, designed for a young couple. 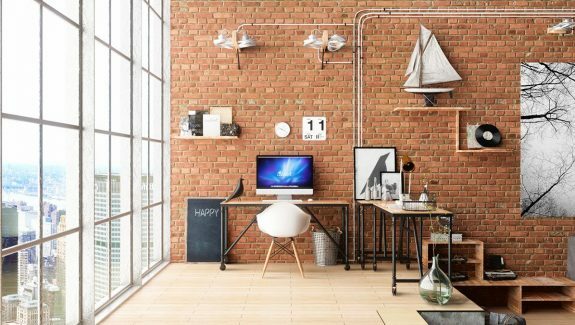 A quirky affirmation of happiness leans up against brickwork in the lounge. 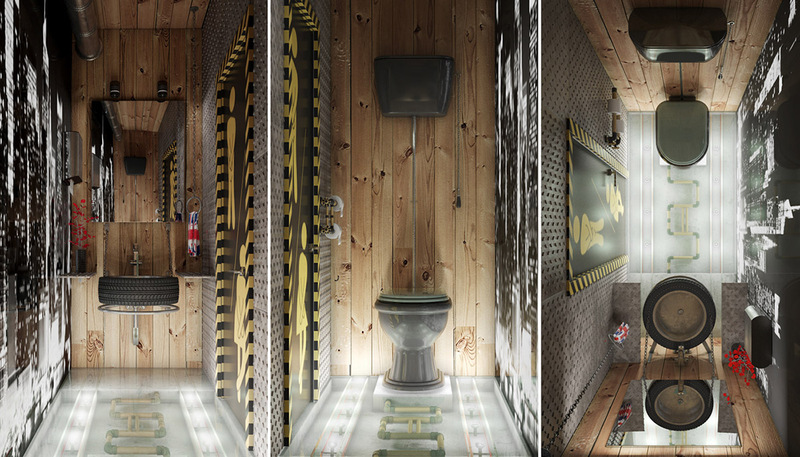 The industrial decor is spiked with humour, an unusual and refreshing combination. 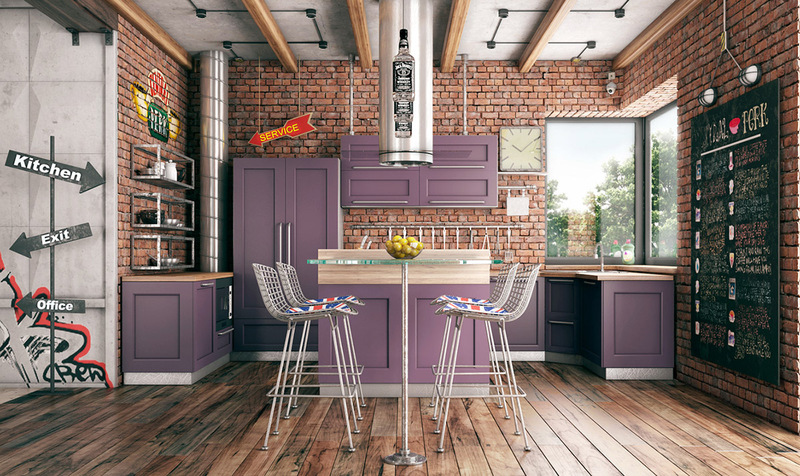 Haphazard directional signs point around the home and a bright purple kitchen. Union Jack cushions sit at a bar beneath a row of emptied Jack Daniels bottles converted into pendant lights. 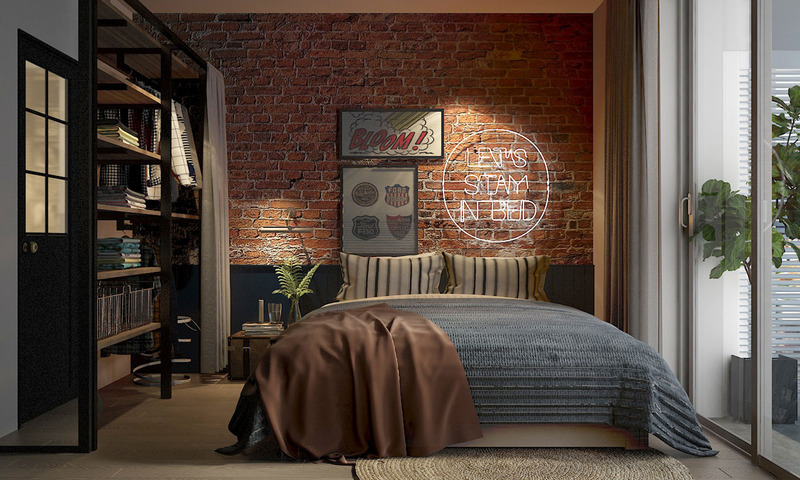 Graffiti livens up a concrete wall, whilst a friendly ‘Central Perk’ sign brightens brickwork. 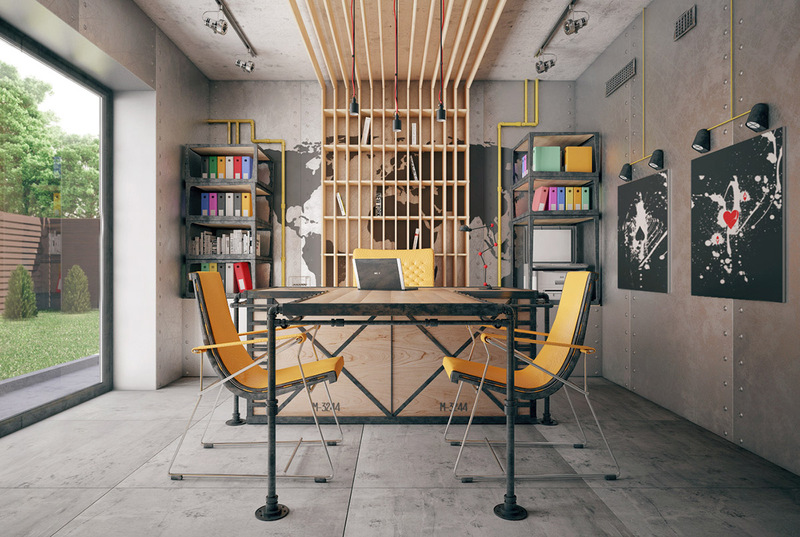 This colourful home office is sure to get creative juices flowing. 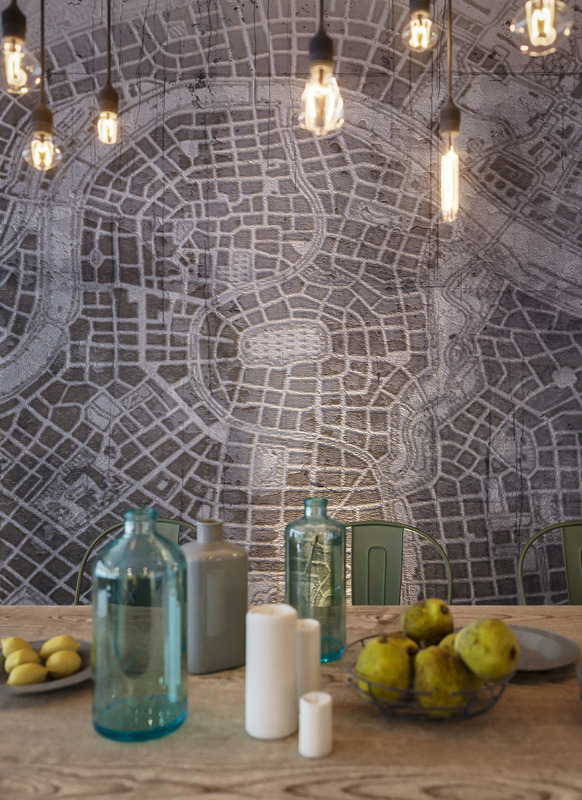 A world map makes an inspiring office wall mural. Candy colour pendants drop from the hall ceiling. A Coca Cola fridge is stocked with soft drinks and copious amounts of alcohol. 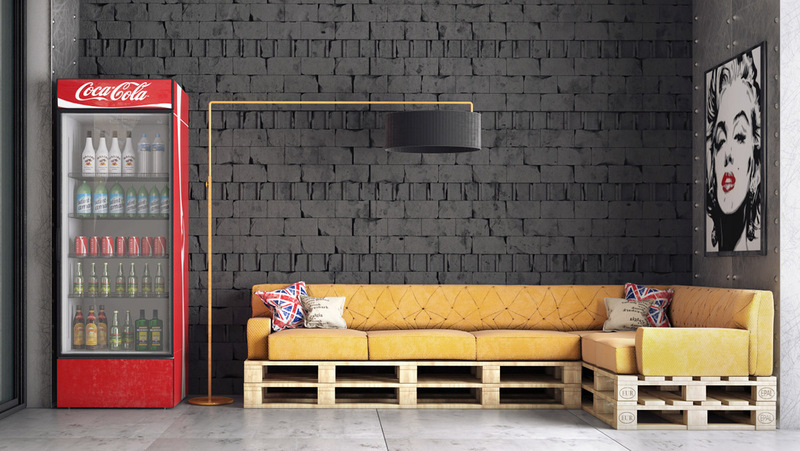 A bespoke pallet sofa is topped with happy yellow seating. The cloakroom door is marked with an amusing male/female toilet sign. 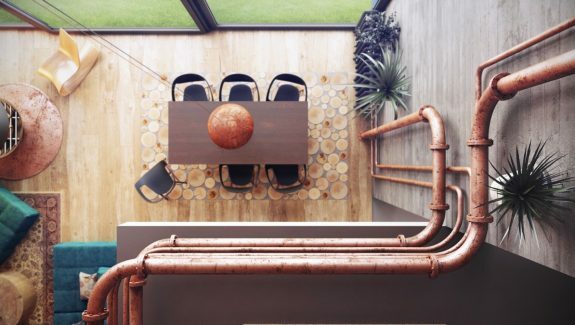 Pipework is made visible through a perspex floor.